Want To Unlock The Rest of The Training On My Site? Have you ever logged onto Facebook and found out someone close to you bought or sold a house without you? This course was created to help you avoid that from ever happening again. 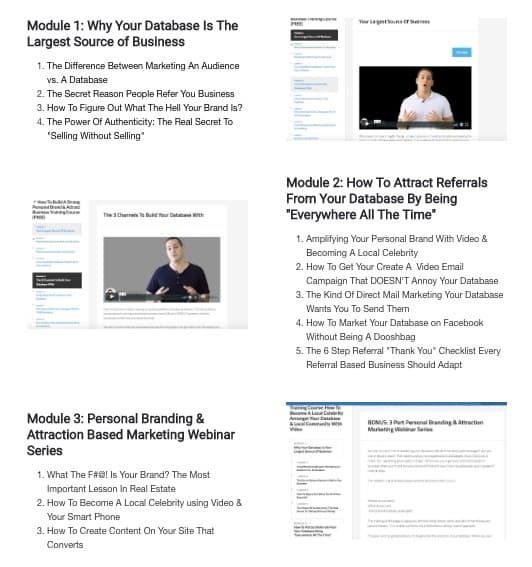 This training course on this page will show you exactly how to create a brand your database knows, likes, and trusts. Agents with a strong personal brand are LESS LIKELY to be forgotten by their database and MORE LIKELY TO BE REFERRED OR HIRED! Did you know over 60% of ALL consumers work with agents they already know, used in the past, or are referred to? It's not your database's job to refer you business, it's your job to remind them to! If the majority of your business is dependent on 3rd party lead generation companies, you are not running a business. You are just another sales person chasing leads! Inside, I’ve placed my blue print that will teach you how to build a strong personal brand around your real estate business and begin ATTRACTING vs. chasing business using video and local content creation. When you are positioned as the expert, your brand becomes more valuable. Agents with a strong personal brand don't chase business, it chases them. We'll lay out the entire strategy so you can begin building your own personal brand being "everywhere all the time". $29 is affordable for any agent serious about their business. Anyone who won’t invest $29 in their real estate business isn’t serious enough to follow the system anyway. If for any reason you think this isn’t the best $29 you’ve ever spend, just send me an email and I’ll gladly refund you the whole $29. Over 65% of business comes from referrals, past clients, or people you already know. 10-15% of your network is moving this year. 100% of your network has the ability to refer you at least 1 people this year. I want to teach you how generate the attention of your database using video in your business! Doing this makes keep your brand top of mind while you nurture your relationships with your most important asset, the people you know. I don't know about you, but I like working smart not hard! I want to help you build your brand amongst your database and local community and taking this training course is the first step. Building a strong personal brand has one goal. Become the most known liked, and trusted agent amongst your network.